The Nicklaus Children’s Health Care Foundation and Miami Children’s Health System recently announced a $60 million pledge to support the sustained growth and advancement of the health system’s acclaimed Miami-based children’s hospital. In recognition, Miami Children’s Hospital—the flagship of Miami Children’s Health System—and its network of outpatient centers will bear the Nicklaus Children’s Hospital name, effective in March of this year. 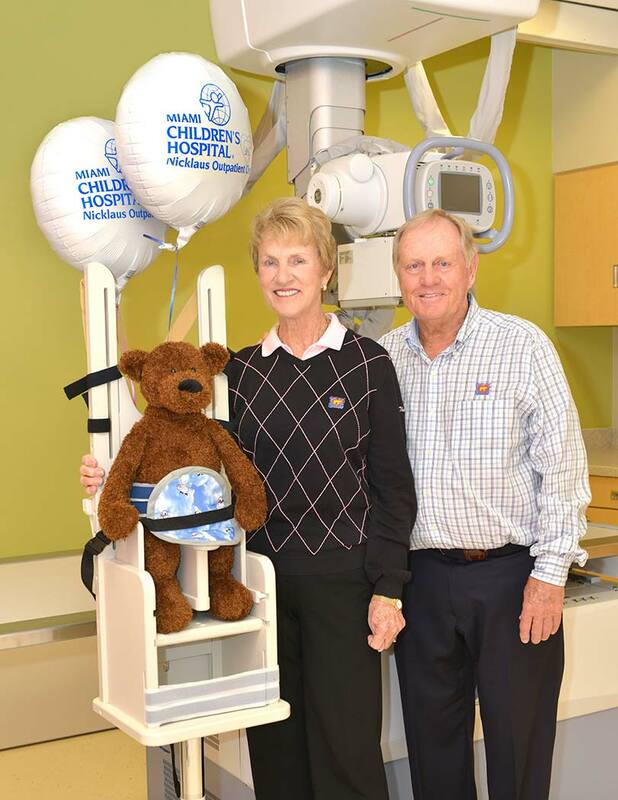 As an extension of their support and involvement with Miami Children’s Health System, Jack and Barbara Nicklaus will also serve as the Chairs of the Together For The Children Campaign, which has a goal to fundraise $150 million dollars through 2017. The Nicklauses are already hard at work! Together with the Lawrence J. and Florence A. De George Charitable Trust, the Nicklaus Children’s Health Care Foundation donated $15 million to Jupiter Medical Center, marking the largest one-time donation in the Medical Center’s history. The funds will help develop pediatric services at Jupiter Medical Center in partnership with Miami Children’s Hospital. The first phase of the project is a 12-bed inpatient pediatric unit at Jupiter Medical Center, bringing world-class pediatric services to Palm Beach County. More than a year ago, Miami Children’s Hospital and Jupiter Medical Center partnered to enhance pediatrics in North Palm Beach County. Since then, Jupiter Medical Center has implemented telehealth technology, enabling Miami Children’s Hospital physicians to interact with Jupiter Medical Center’s physicians and patients remotely to consult on a patient’s care in real time while the patient is in the Medical Center’s Emergency Department. Additionally, Jupiter Medical Center has two pediatric ER physicians in place during peak hours, and also offers pediatric MRI services in collaboration with Miami Children’s Hospital. Miami Children’s Hospital, which celebrates its 65th anniversary in March, has a long and distinguished tradition of serving children. The 289-bed private, nonprofit freestanding hospital receives children from throughout Florida, the U.S. and more than 75 countries. It is renowned for excellence in all pediatric specialties and has more pediatric programs ranked among “America’s Best” by U.S. News & World Report than any other hospital in Florida.